Penn State has...problems. In no specific order...their defense is being held together with bailing wire, their offensive line is simply just bad, their head coach should definitely not be coaching at a P5 school and their starting quarterback has all of Devin Gardner's pocket presence and then some. Simply put...there was no way Michigan was going to lose this game let alone not cover whatever the huge spread was. This game was over by the end of the 1st quarter...and in reality, probably over the minute James Franklin started game planning early last week. Sorry Penn State fans, I know you love him for reasons passing understanding, but if you want to rebuild your program with integrity and actually win football games against teams with numbers next to their names indicating a ranking of some degree...then you must cut Franklin loose ASAP. Michigan finished the game with 326 yards on 49 carries, for a healthy average of 6.7 yards per carry. Say what you will about Penn State's 92nd ranked rushing defense...Michigan had done worse against comparable defenses in the past. What struck me the most wasn't necessarily the holes and the blocking, which were both fine, but it was the way Michigan's stable of 4 running backs ran the ball. 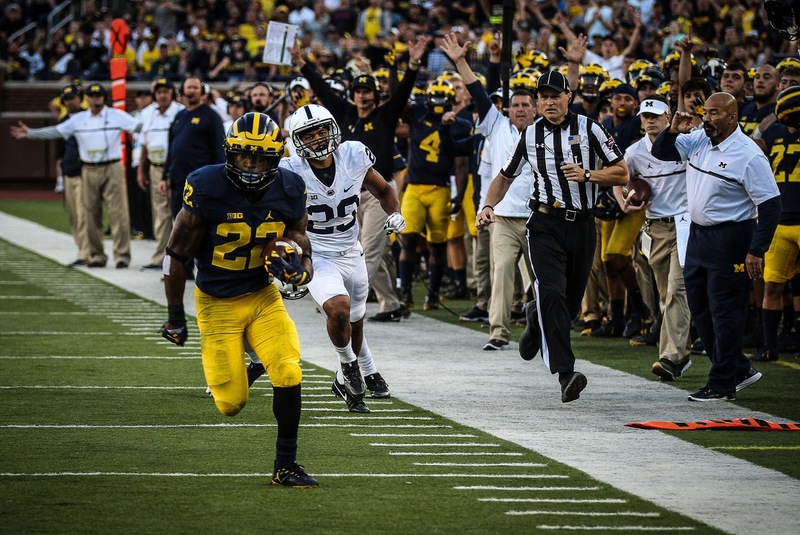 De'Veon Smith, Karan Higdon, Ty Isaac and Chris Evans all seemed as if they're getting stronger as the game wore on. Michigan is still a team that must rely on the arm of Wilton Speight, and that's probably not going to change anytime soon. But I am at least confident that the running game will continue to improve as the season wears on. Wisconsin boasts the #10 rushing defense in the country...so we'll find out this week just how far we've come and how much further we have to go to become a power rushing offense. No doubt the worst moment of the game was Jeremy Clark going down without contact on kickoff coverage early in the 4th quarter. You could see right away on the replay that it wasn't going to be something he'd be coming back from any time soon. You have to feel for the 5th year senior who's season and likely career are done. I'm sure he'll at least look into getting a 6th year via a medical hardship. Clark's injury definitely raises a huge concern for the depth in the secondary. The starting cornerback was a huge lift to the defensive backfield while Jourdan Lewis was out. But with Lewis back, that at least helps somewhat. Expect to see much more Tyree Kinnel moving forward. Smith ended the day with 107 yards on 12 carries...YPC-wise, one of his best outings by far. His vision running the ball seemed to be the best its ever been. Cut backs and yards after contact were huge for Smith in this one. Not only that, he gets this week's game ball for his excellent pass protection. Time and again, Penn State would blitz and Smith was there to pick it up. Speight took far less hits in this game thanks to added pass pro and De'Veon was a huge part of that. He was lights out in his first game back from whatever nagging injury had kept him out of the first 3 games. Lewis was in mid-season form as he blanketed receivers both on the outside and in the slot where he was the most effective. There is a reason Penn State's best receiver, Chris Godwin, only had 1 catch for 8 yards. He wasn't tested often, but when he was it wasn't a good decision by McSorley. Michigan registered 6 sacks against McSorley and I'm sure a few if not all were caused by superb coverage. For what its worth, Penn State's punter Blake Gillikin has a tremendous leg. He learned right away that punting to Jabrill Peppers was not going to be a good idea when he returned the first punt 53 yards...just a few yards short of a touchdown when Peppers' lost his balance just shy of the goal line. From that point on it was booming high punts, punts out of bounds and kickoffs aimed at Jourdan Lewis. For my money, he's Michigan's most dynamic and exciting punt/kick returner since Desmond Howard. Penn State's offensive line, if that's what you want to call it, never stood a chance against what is basically an entire 2-deep worth of potential NFL talent for Michigan's defensive front. Michigan didn't blitz as much as they had in earlier games...but they didn't need to. The goal was to pressure McSorley with lockdown coverage...and force him into running where Michigan's linebackers would be waiting. Same goes for Saquon Barkley. The Big Ten's best rusher was held to 59 yards on 15 carries thanks in large part to Michigan blowing up almost every play through the middle of Penn State's offensive line. When #4 is healthy and gets it going, he is Michigan’s version of Frank Gore and that is exactly the type of bruising, pounding back this Harbaugh Offense desires. Stay healthy my friend – we have some payback to make good on this year.